Awesome you are involving your children in your giving. Children rasied on giving will never depart from it and will grow into giving adults. My very favorite book on giving is Max Lucado's "Small Gifts in God's Handds." I'll have to look for the one you suggest. 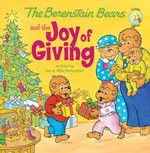 My kids had all the Berenstain Bear books growing up and loved them. That is awesome that you were able to spread some joy this holiday season. It's never too early to teach the young ones about the gift of giving. that is an amazing idea and great to do.. That is so kind what you did with your family.. Have a great night..